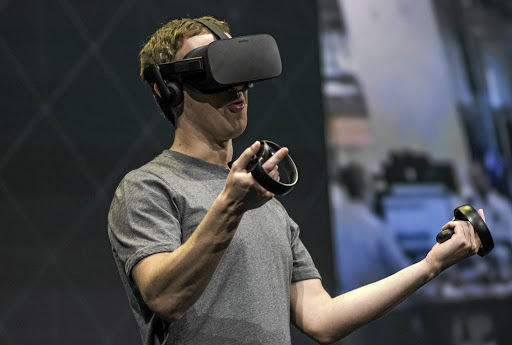 Mark Zuckerberg, chief executive officer and founder of Facebook, demonstrates an Oculus Rift virtual reality headset and Oculus Touch controllers. If Facebook thought it would take virtual reality into the mainstream, it got off to a bad start. A few weeks ago Mark Zuckerberg broadcast a video over his social network showing himself "touring" the flood-hit disaster zones of Puerto Rico in virtual reality. Against a backdrop of locals attempting to repair their damaged communities, Zuckerberg's avatar promoted the power of his new technology, shared a cringeworthy virtual high-five with a colleague, and then teleported to the moon. The sight of a tech billionaire dropping in on the plight of millions from the comfort of his California office was criticised as tasteless. A day later, Zuckerberg apologised. The episode did nothing to banish the notion that VR - one of Facebook's biggest bets for the future of its two billion users - is more of a rich techie's plaything than a technological leap. In 2014, Zuckerberg spent $2-billion to acquire Oculus, a company founded by a teenage enthusiast called Palmer Luckey. It was seen as a defining moment for VR, which has long been the stuff of science fiction, but that advances in computing had failed to match. "One day, we believe this kind of immersive reality will become a part of daily life for billions of people," Zuckerberg said. That day has not come, at least not yet. But you couldn't tell VR is struggling from the scenes at the McEnery Convention Centre in San Jose the same week as Zuckerberg's apology where, dressed in his trademark uniform of grey T-shirt, jeans and trainers, he walked out on stage to cheers from developers and Oculus employees. Zuckerberg claimed VR could break down the economic inequalities created by geographic division. He told the story of Dorothy Howard, an 80-year-old British grandmother who travelled the world in VR. "If you can't think of any way your reality can be better [in VR], you're not thinking hard enough," he said. Proponents point out that the experience - of being fully immersed in worlds and places that are not our own - is so radical, so brimming with potential, that it can't help but succeed eventually. But many in Silicon Valley don't share Zuckerberg's optimism. Last week, Tim Cook, Apple's chief executive, compared it unfavourably with augmented reality, a sister technology that involves virtual objects interacting with the real world via a phone's camera. "There are clearly some cool niche things for VR but it's not profound in my view," Cook said. VR's biggest audience has been video gamers, a stereotype that's done little to dispel the notion that it's a product for a pocket of largely male, well-off and technically minded users. This is partly because most of the expense associated with VR is the powerful computers typically found in gaming households. Facebook unveiled a new Oculus headset that will cost $199 (R2,730) - half the price of the current Rift - and, crucially, will work independently of a computer, making the technology much more accessible. Zuckerberg sees the technology as the next wave of social networking and Facebook has already made a VR version of its social network that allows virtual avatars to meet up and talk "face-to-face". Facebook's founder has built his fortune on predicting the future. VR has been far from the instant success Zuckerberg has tasted elsewhere. But he's not used to losing.